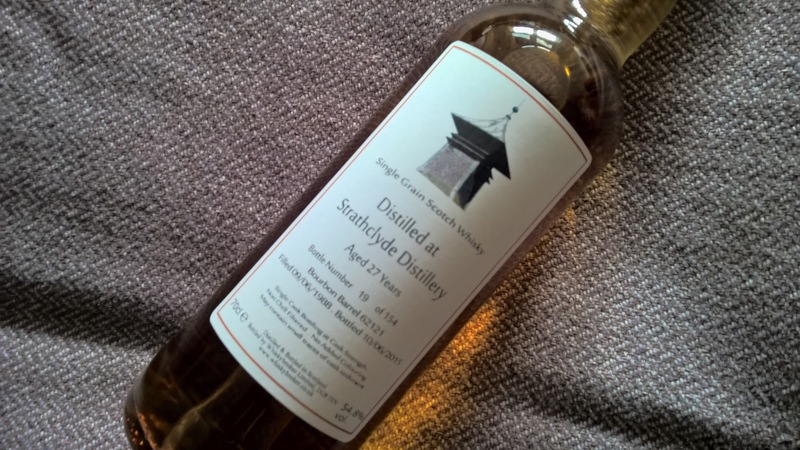 There isn't much to say about Strathclyde distillery that hasn't been said previously in my earlier review of the sublime 25 year old Clan Denny release. Due to this excellent bottling I had high expectations of this 27 year old grain whisky released by the independent bottler the Whisky Broker. This bottle had already been recommended to me by a couple of sources so it was a 'must purchase' option last month and an ideal grain inclusion for a tasting I'm organising. After the debacle that is Diageo's Haig Club which I went out and bought last year to review and instantly regretted it! Many would have written off grain whisky, yet I know with prolonged periods it can take you in all sorts of wonderful new directions. Yes, I put my money where my mouth is yet again and spent £45 on what turned out to be a glass ornament. I'm always eager to try new releases when the wallet allows and accept that sometimes I'll be disappointed. There are too many releases nowadays on a monthly basis and their price tags keep on rising. If it wasn't for the impending bubble going pop! I'd be stockpiling whisky for future decades as if this trend continues how much will a decent bottle cost in 10 years time? Nose: tropical juicy fruits manifesting themselves into a delicious Pina Colada. Staple characteristics of marzipan and coconut with chewitts and toffee. A Victoria sponge brim full of fresh cream and strawberry jam. Taste: very, very drinkable. An oily quality and a lovely feel in the mouth. Sugary sweet with tablet, golden syrup and honey. A really enjoyable grain whisky that did have an attractive price. Sure, it's not richly layered and lacks the wow factor but at these pricing levels you're more inclined to take a chance on a bottle. So I'd urge you to try doing so in the future and keep an eye out and ultimately try other releases from this bottler.